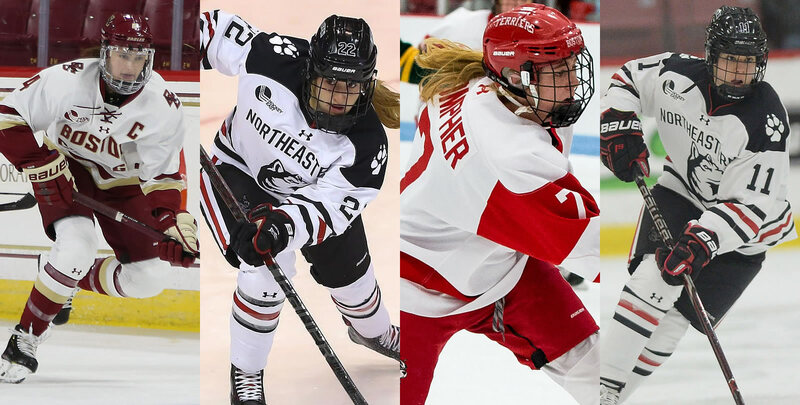 Five players who advanced to the NCAA Women's National Collegiate Ice Hockey Championship in Hamden, CT, including two each from two-time defending NCAA Champion Clarkson University and the top seeded University of Wisconsin, have been recognized as 2018-19 CCM/AHCA WOMEN'S UNIVERSITY DIVISION ICE HOCKEY ALL-AMERICANS. The fifth participant among the semifinalists hails from Cornell. The only semifinalist without a player receiving All-American status is the University of Minnesota. - Boston College senior defenseman Megan Keller is a First Team selection for the third time. Wisconsin senior forward Annie Pankowski is on the First Team after two years on the second team. Both were U.S. Olympians last season. Four other players were previously honored, one being repeat First Team forward Loren Gabel of Clarkson. - Five players hail from Canada, five players come from the United States, and one each from Sweden and Switzerland. - There are four seniors, three juniors, three sophomores and two freshmen. - Five selections came from ECAC Hockey, four from Hockey East and three from the WCHA.